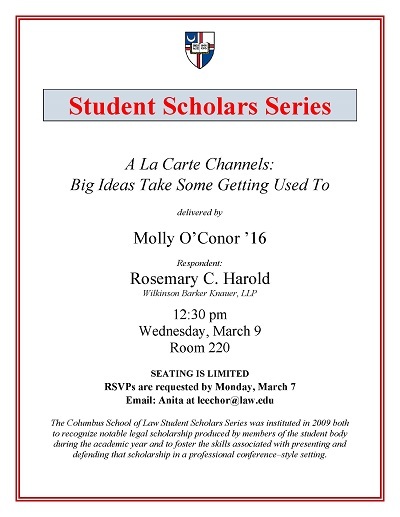 Molly O’Conor (3L) delivered the second Student Scholars Series lecture of the 2015-16 academic year on March 9th. O’Conor’s scholarship, “A La Carte Channels: Big Ideas Take Some Getting Used To,” discussed the Federal Communications Commission’s recent proposal to reinterpret the term “Multichannel Video Programming Distributor” (“MVPD”) to incorporate Internet service providers. O'Conor, Molly, "A La Carte Channels: Big Ideas Take Some Getting Used To" (2016). Student Scholar Series. 16.